The Great Wall of Lucy Wu by Wendy Wan-Long Shang. Grades 4-6. January 2010. 312 pages. Reviewed from ARC provided by publisher. Eleven-year-old Lucy Wu knows that sixth grade is going to be her best year ever. Not only will she be at the top of the pecking order in her school and going out for captain of the sixth-grade basketball team, but her older sister is going to college, leaving Lucy to enjoy a bedroom all to herself for the first time. But when Lucy finds out her great-aunt Yi Po is coming from China and will be sharing her room, everything is ruined. To make matters worse, a Chinese school is started up in their neighborhood and Lucy is expected to give up basketball to study Chinese. Isn't anything going to go right this year? This is a fresh, funny debut from an author I'm definitely going to watch! Lucy's a relatable, realistic sixth-grader figuring out where she fits in within her family. Her older sister calls her a banana - yellow (Asian) on the outside, white on the inside - because Lucy doesn't speak Chinese well and thinks some Chinese delicacies are gross. But as we see Lucy grow throughout the course of the novel, she figures out where her place is and begins to embrace parts of her Chinese heritage. Don't think that this book is all about Lucy's culture, though. It's also about sports and crushes, dealing with bullies, being embarrassed by your family... I love that it's a story about an Asian-American girl that's not solely about racial or cultural issues. The style and realistic protagonist reminded me of the Judy Blume books I so loved when I was a kid (think Blubber or Tales of a Fourth Grade Nothing, not Forever...). I think it would make a great readalike to Millicent Min, Girl Genius and Stanford Wong Flunks Big Time, both by Lisa Yee and I'd also try it on fans of Andrew Clements' realistic fiction. Of note: Wendy Shang blogs at From the Mixed-Up Files of Middle-Grade Authors. 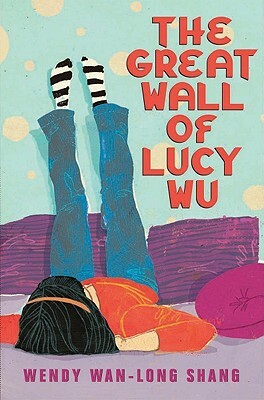 The Great Wall of Lucy Wu is on shelves now!